New coach. New era. New uniforms. ​The transition from Dan Mullen to Joe Moorhead is the eighth consecutive head coaching change at Mississippi State to coincide with a change in uniforms, dating back to the transition from Paul Davis to Charles Shira in 66/67. The extent of the changes has varied with each coaching change; the slight changes from Mullen to Moorhead are probably the most subtle since the transition from Bob Tyler to Emory Bellard in 78/79, when the only change was adding a "U" to the helmet logo. The other six coaching changes all coincided with more major uniform changes, such as changes in helmet color or striping patterns. The changes to Mississippi State's football uniforms in 2018 are subtle enough that the average fan probably won't notice a difference. The overall design will remain the same, but a number of minor changes will result in what I think will be a much cleaner, more consistent look. Contrary to what you might think based on the spiel above about coaching changes always coinciding with uniforms changes, the reason that these changes are happening is not the change in head coach, but the fact that Adidas is rolling out a new template. Every Power 5 Adidas school is upgrading to the Primeknit A1 template this fall; the new template offers a more streamlined look with a more subtle, ribbed pattern in place of the former, more gaudy pattern that covered the entire jersey. 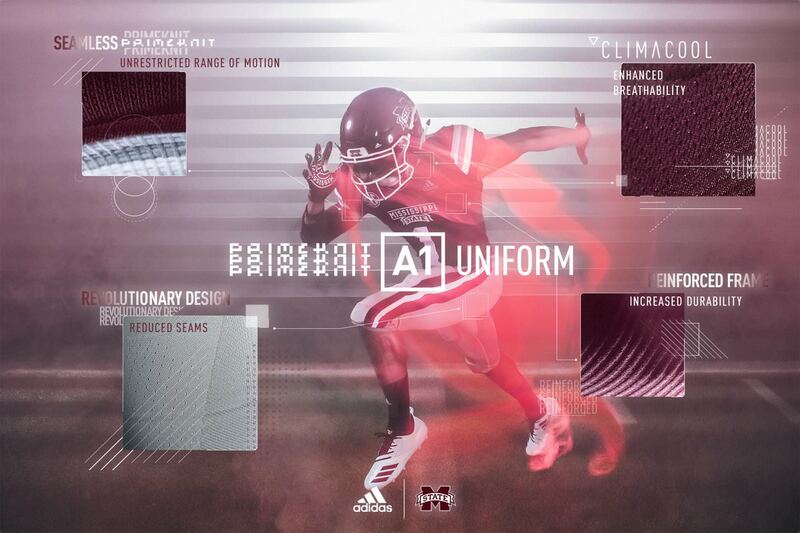 The new template alone will be a huge upgrade for Mississippi State and the other top Adidas schools. Along with the other minor changes (a couple of which are a direct result of the template change), ​the 2018 uniforms might just be the best the Bulldogs have ever had. Adidas jersey logo moved from directly under the collar to the left chest. SEC patch moved from the left chest to the right chest. Adidas pants logo moved from the right hip to the left hip. M-State logo moved from the left hip (left stripe on gray pants) to right hip. Collar changed from solid white to white-gray-white on maroon jerseys (and presumably changed from solid maroon to maroon-gray-maroon on white jerseys). Black outlines removed from the numbers on the maroon jerseys. Outline on State of MS patch changed from black to gray. Name on back font changed from the custom school font to a thinner, more standard NOB font. Pants stripes made slightly thinner, with the outer stripes becoming thicker than the inner stripe. Most of these changes were not surprising with the introduction of the new template; the Adidas logos are on the left chest and left hip on every single Primeknit A1 uniform, so those changes and the resulting patch/logo movements were expected. 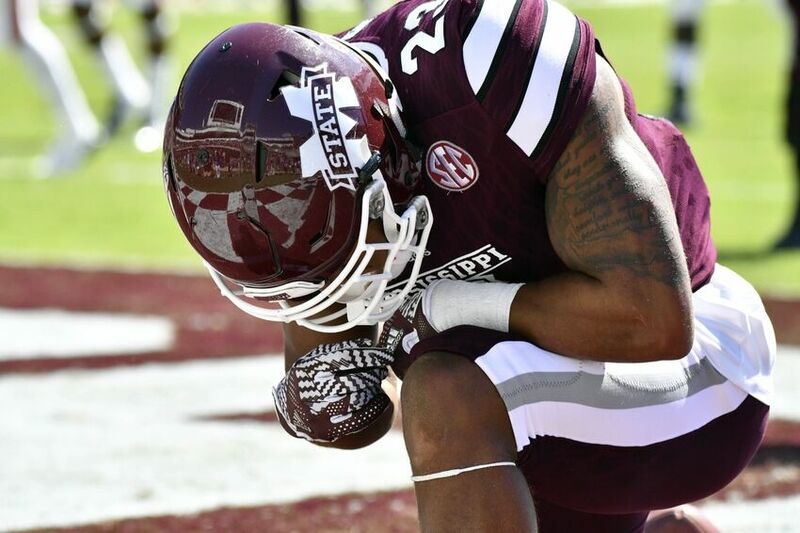 In addition, the black outlines on the numbers (maroon jersey) and state of MS patch (maroon and white jerseys) were expected to be removed to complete the eradication of black from the Bulldogs' primary uniforms. The more surprising changes were the new collar stripes, name on back font, and thinner pants stripes. The collars are shaped differently on the new template, so I thought something might change there, but wasn't sure what. The solid white collar on the 2017 maroon jerseys was a bit jarring, especially when gray pants were worn, so I'm not upset to see changes made there. I think going with a striped collar that mimics the sleeve and pants stripe is probably the perfect middle ground- so great job to the people who made that happen. The name on back font is the only change I wasn't sure about on first glance, but after looking at it some more I think it will be a solid upgrade. After using the same custom font as the numbers since the DWS 100 uniforms debuted in 2014, the name on back font is returning to the more standard font used from 2012-2014. This should result in a more streamlined look for the back of the jersey. The final change is the thinner pants stripes, which I called for in the 2017 season recap. The pants stripes, while so much better than the oversized M-State logo that was on the pants in 2014 and 2015, were ​really wide in 2016 and 2017. So I'm happy to see the stripe get thinned up a bit this year; just like all of the other changes, they will contribute to the Bulldogs' improved look in 2018. In addition to the standard Maroon-Maroon-White combo, we've also gotten a look at the Bulldogs' updated gray pants. First introduced back in 2015, the gray pants had a slightly different design than the white and maroon pants that were introduced in 2016. Instead of having a two-color M-State logo on the left hip, the gray pants had a single-color (white) M-State logo on top of the left stripe. With the template upgrade, that is no longer the case. In 2018, the gray pants will be in line with the white and maroon pants, featuring a two-color M-State logo on the right hip and the Adidas logo on the left hip. 2014: DWS 100; single color helmet logo with silver outline; Shockweb Template; oversized pants logo. 2015: Transparent banner helmet logo with silver outline; Primeknit Template; oversized pants logo. 2016: Transparent banner helmet logo with no outline; double sleeve stripes w/ black outlines; pants stripes. It's taken a while, but I think we've finally completed the cycle. 2018 and 2019 should break the cycle and become the first back to back seasons with the same primary home uniform since 2012/2013. I won't say this year's look is going to be perfect, but it's going to be pretty close to it. A very strong argument could be made that it will be the best look in Mississippi State's football history. The only 2018 uniform elements we've seen thus far are the maroon helmets, maroon jerseys, white pants, and gray pants. However, it can be reasonable assumed that white helmets, white jerseys, and maroon pants will also be in the uniform lineup this season, featuring designs consistent with the elements that we've already seen. 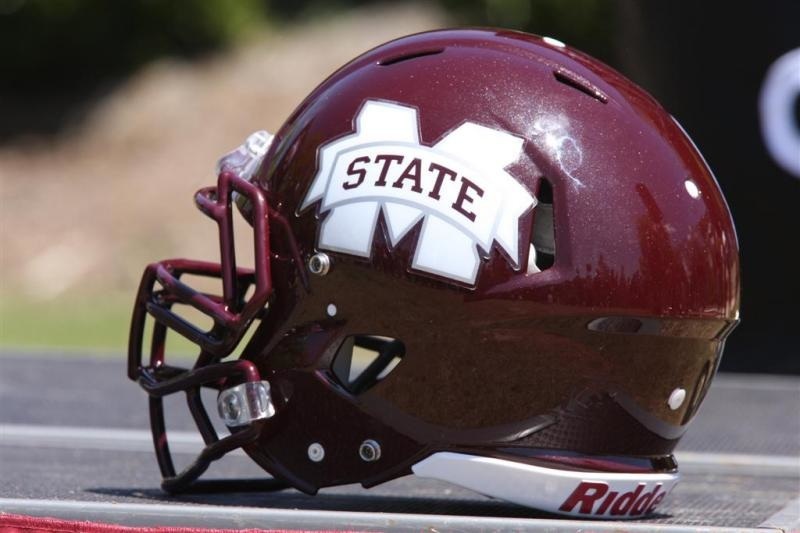 The shiny maroon helmet with a white facemask and white M-State logo is expected to return for its fourth year as the Bulldogs' primary helmet; the exact design was first worn against Troy in 2015. It has since been worn in 22 games, the most a single helmet design has been worn since the 09-10 design was worn in 25 games. If this design is worn is worn in more than 3 games this season, it will become the longest tenured Mississippi State helmet design since the Croom Era white helmets. 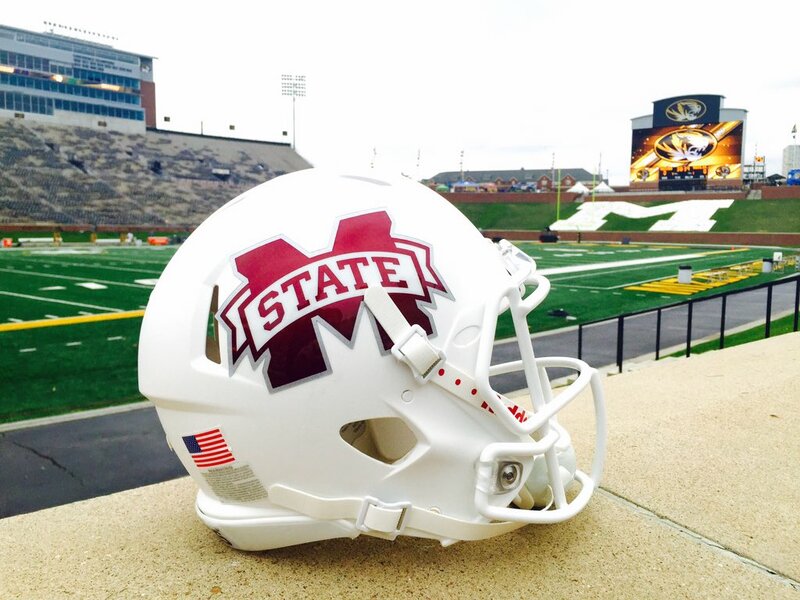 The matte white helmet with a white facemask and maroon M-State logo outlined in silver is also expected to return for it's fourth season of action. The Bulldogs' current white helmet debuted at Missouri in 2015 and has been worn 6 times, all but one of which were on the road with the white jerseys and pants to create a really clean stormtrooper look. I think that there is a decent chance we might see it at home again this season, paired with the updated maroon jerseys and white pants; it will almost certainly be worn on the road at least once in that all-white combo. At this time, I don't expect the silver helmets to return this season. No concrete evidence, just a feeling I have based on the fact that they haven't been used in any pictures with recruits or anything this offseason and were only worn with alternates last year. I could very well be wrong on this; it wouldn't hurt to roll them out sometime in that 5 game stretch from Florida to Louisiana Tech where State will likely wear maroon jerseys each game. We'll see. As far as other helmets go, something new is always a possibility. Last year was an oddity in that there weren't any new helmets worn; 2016/2017 were the first back-to-back years in which Mississippi State had the exact same helmet lineup since 2009/2010. Options for a new helmet design could include bringing back matte maroon for road games, adding a black helmet to create a true blackout look, or simply adding a stripe or changing the decal on one of the current helmets. If you look closely at the Primeknit A1 graphic for Mississippi State, you'll notice that an alternate helmet design is shown, featuring a maroon (rather than white) M-State logo on the maroon helmet. Odds are this is just an error in the graphic, but it's worth noting and will be interesting to look back on if that design does show up at some point. The maroon jersey, as seen above, has been officially revealed. I expect the white jersey will follow the same format, with a maroon-gray-maroon collar stripe. Those will, of course, be the Bulldogs' two primary jerseys in 2018, and possibly the only two. More on potential alternates later. I expect State to have three pants colors in 2018, just as they have the past few years. 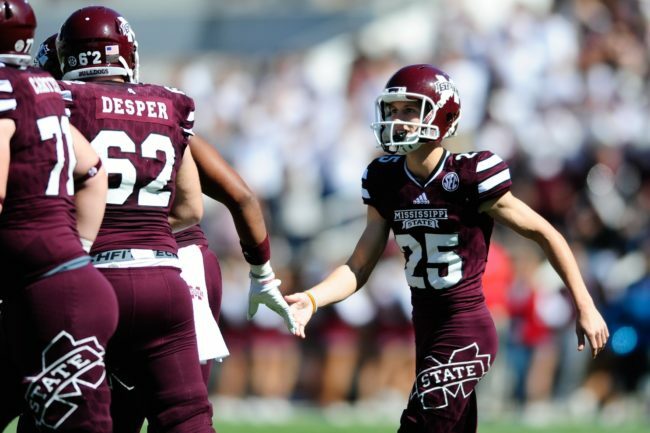 The white and gray pants have already been revealed; the maroon pants should follow the same format, with white-gray-white stripes being slightly thinner than last year. Though we're still with Adidas, 2018 is the mark of a new era at Mississippi State with Joe Moorhead becoming head coach. This change in eras could very well mean slowing down the constant stream of alternate uniforms every single year for Mississippi State. Nothing is certain, but it's worth noting that there is no "blackout" game on the schedule this year. I honestly expected the Texas A&M game to get the "blackout" designation like it did back in 2016; the fact that it didn't is a pleasant surprise. Still, just because there's no blackout doesn't mean there won't be any alternate uniforms this season or even in that game. 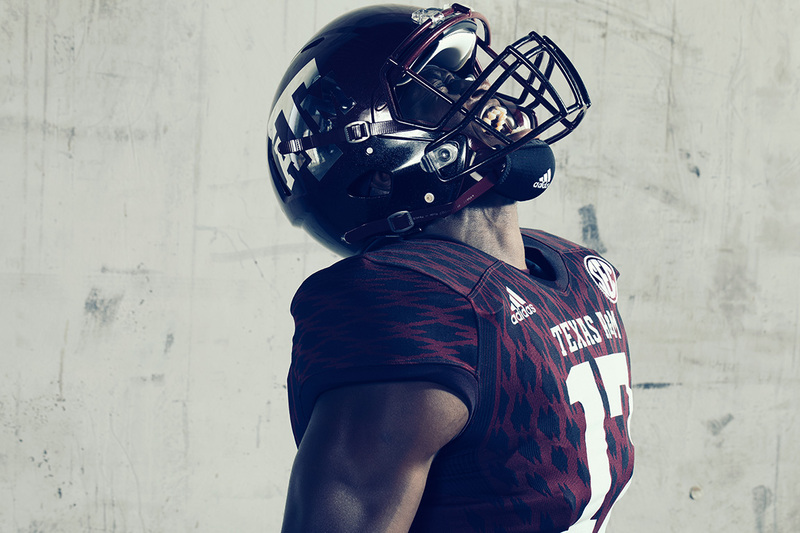 The history of alternates begin worn in the Mississippi State vs Texas A&M football rivalry is well documented, so it's still very possible that one or both of the two teams will roll out an alternate for that game. Alternate possibilities for Mississippi State could include silver helmets, gray jerseys, Veterans Day uniforms (which have been done the past two seasons, so probably time to let that idea rest for a little while), or an all-black look (which, again, doesn't seem likely given there is no "blackout" game.) 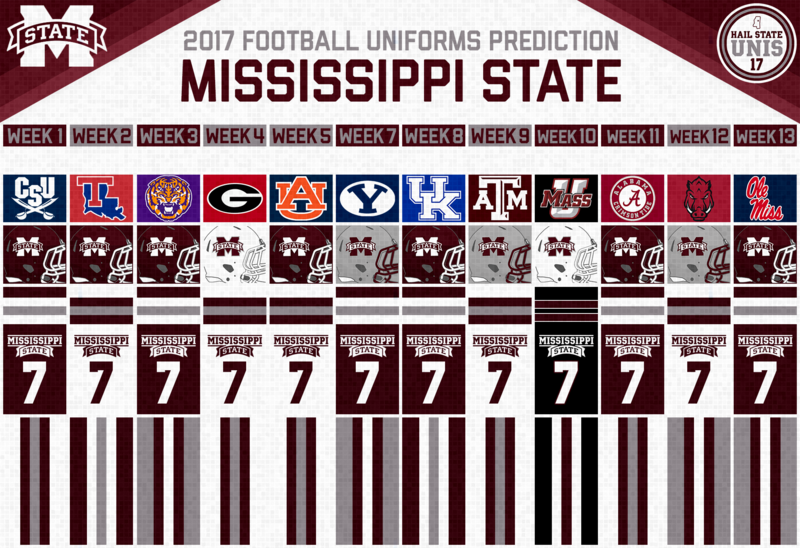 So, while nothing is definite, the odds that Mississippi State wears an alternate are lower this year than they have been in any season in recent memory. ​SFA: Maroon/Maroon/White: State has worn maroon jerseys and white pants in every season opener since 2008.
at Kansas State: Maroon/White/Gray: Gray pants would match up very well with Kansas State's Silver/Purple/Silver home look. Louisiana: Maroon/Maroon/Maroon: Non-conference game that's not the season opener nor homecoming. Perfect time for all-maroon. Kentucky: Maroon/White/Maroon: Good time to work in maroon pants on the road. Could also see all-white here like in 2016. Florida: Maroon/Maroon/Gray: Dan and Scott are back in town, gotta go with our best look. LSU: Maroon/Maroon/White: The last time we wore this color combo in Baton Rouge, good things happened. Texas A&M: Maroon/Maroon/White: Again, this is the best time for an alternate if we do one, but going with M/M/W here for now. Louisiana Tech: White/Maroon/White: Homecoming; I think it'd be a good time to break out the white helmets at home, especially if it does end up being the fifth straight game in maroon jerseys. Alabama: Maroon/White/White: I feel like this is our most "business" road look. Matches up well with Bama's classically plain home uniform. Arkansas: Maroon/Maroon/Gray: Go with gray pants for the last home game of the season. Ole Miss: White/White/White: I'm down for a complete repeat of the 2016 Egg Bowl (never forget 55-20), right down the clean all-white uniforms. Last season, I got the exact combination correct in 4/12 games, helmet color correct in 7/12 games, pants color correct in 7/12 games, and jersey color correct in 12/12 games. I got at least 2/3 uniform elements correct in 10/12 games; the Alabama and Arkansas games were the only ones in which I missed on both helmet and pants color. So not terrible, but I'm hoping for an even better record this season. The final piece of uniform news this offseason doesn't have to do with on-field uniforms, but with practice jerseys. State got a slight upgrade in that department this season, with a "Bulldogs" wordmark (in the school's custom font) being added to the front chest. I like the change; it looks better than it did without the wordmark. It also creates a nice system of having the school name on the game jerseys and nickname on the practice jerseys. There you have it, the 2018 Mississippi State football uniform preview. The changes, while minor, really clean up the look in my opinion, and create what is finally a complete, consistent set that the Bulldogs should be able to keep until the next Adidas template upgrade in three years or so. Now, coach Moorhead and staff just need to put together a few great seasons in these uniforms so that they become ingrained as "our look." We've finally got it right, now let's hang on to it for a little while. Looking forward to a great 2018 season. Hail State.